However, I’m concerned for two reasons, and you should be as well. One, of course, are the new mechanical switches. These aren’t official Cherry MX Blue/Brown anymore, but are “custom, in-house” switches. They’re custom, but certainly not in house. While Razer has admitted that they do not manufacture the mechanical switches themselves, the manufacturing is “carefully supervised by Razer officials at the production facility to maintain quality standards”. No one knows exactly what standards Razer has (and if you’ve ever owned a Razer mouse, is pretty low), but it is quite possible that the new switches are made by Kailh, an overseas facility that has earned a bad reputation for poor quality key switches, as demonstrated in this explanation from Ripster. Now, the Razer switches do not explicitly have “Kailh” printed on every switch, but instead maintain the appearance of in-house manufacturing with a RAZER logo on every switch. Keep in mind that this is mere speculation, and it could be exactly the opposite, that Razer has actually created something 20% better than a Cherry MX switch (60m keystrokes for Razer vs 50m for Cherry). My problem: if Razer has in fact made the technical achievement they claim to make, why would they want to keep this sort of information in the dark? 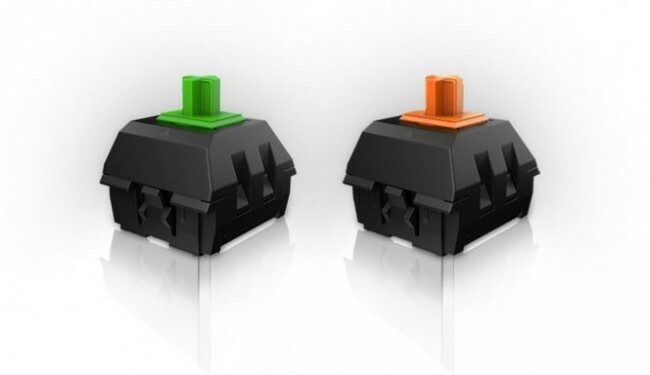 Cherry MX switches are tried and true, and there’s no doubt that Razer could be successful on this accomplishment alone…if only there wasn’t this looming ambiguity floating about. So, how does all of that tie into the “battle on Mac?” Well, it doesn’t. Really, it doesn’t, because for the time being, dedicated hardware for the Mac is gone. Razer has discontinued the standard BlackWidow (the model w/o backlighting) for the Mac, and currently you can only express interest for the Ultimate edition. The situation for retailers has been in this rut since the end of November 2013. With all of this, I ask: Is it really over? Will Razer stop making dedicated Mac hardware?